Goal defines the strategy for an individual, group, organization and countries. When I was studying MBA, one of my professors asked the students; "What is your goal of doing MBA?” Trust me, answers were funny but raised a question in my mind. As a group of people, we are not clear about the goal. There were diverse answers like one student wanted to do an MBA because job market was not good enough and another student entered into the program due to the pressure from her parents. Professor said something which I still remember that MBA is the corporate input to the economy. In the game of foot ball, there is only one ball and for a team, there is only one goal to score. However, Pakistan faces the dilemma of multiple goals. I have joined the MNC through a Management Trainee program and MT Program was designed for the fast track career progression. In few years, our batch was moved to the middle to upper management positions. One of the major challenges I have faced is; alignment of individual and departmental goals to the organizational goals. I asked the team to write their objectives for the organization and there was no synchronization in the responses. People in one team have so diversity in their goals towards the organization. Goal for any individual should have been the contribution towards the profitability for the shareholders. Rest of the goals for department and personal development are part of it but one goal was not clear. As a nation, we are facing the same dilemma of non clarity in terms of national goals. Provinces, groups, clans and people are moving in different directions in the pursuit of diverse goals. We are lacking the process of synergy because we are trying to achieve different goals. Our players have different foot balls and goal post is also different for every player in the team. We can not decide so far that what kind of Pakistan we want to be, in terms of economy, politics and social structure. Pakistan is the nation of extreme talent. 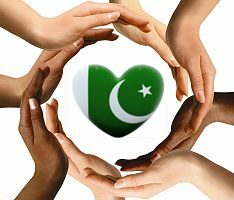 Artists, politicians, Military strategists, scientists, corporate minds, volunteers, students, doctors, engineers and skilled labour are the assets of Pakistan. Pakistan's important resource is its human resources. Resources can not be utilized with maximum capacity and potential if we do not create the concept of synergy among them by giving them one vision and one goal. I don't call myself a man of vision; perhaps I am a man in search of vision. Whatever the strategy we prepare for 5 years, 10 years or 15 years, we need to have one goal that derives the strategy. We have a vision provided by the founders of this nation, but we have not been able to transform the vision into a goal that gives one direction to whole nation.